Immersion learning happens throughout the calendar year at Wabash College. Groups of students are headed Monday to Greece, London, and Chicago for classroom-related learning. Retiring professor of Classics Joe Day will be taking a class to Greece. 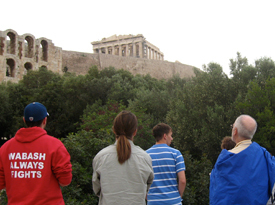 The group leaves Saturday and dives right into ancient Greece Sunday with a visit to the new Akropolis Museum. During the trip students will see several important archaeological sites, Athenian Agora Museum, Olympia and related sites, a site at ancient Corinth, among other stops. Theater Professor Dwight Watson will be leading students to London where they have a week of theater productions, seeing London’s sites and understanding it arts culture. The students leave Friday and get busy Saturday night by attending Little Eagles at the Hampstead Theatre, each performance the students see will be followed by a morning-after discussion. Other plays include: War Horse at the New London Theatre, Hamlet at Shakespeare’s Globe, The Cherry Orchard at National Theatre, and Flare Path at Haymarket Theater. Professor of Education Michelle Pittard takes students to Chicago each spring to participate in a program run in the inner-city schools. Students will observe classrooms and teach before the end of the week. Immersion learning continues during the summer with eight students travel to South America for the annual Ecuador program. This year’s program will feature the usual two weeks of intensive Spanish along with a Biology focus. Professors Bill Cook and Rick Warner will lead a much-anticipated trip this summer to Kenya for students who have been participating in a team-taught religion/history class. That group leaves June 10.